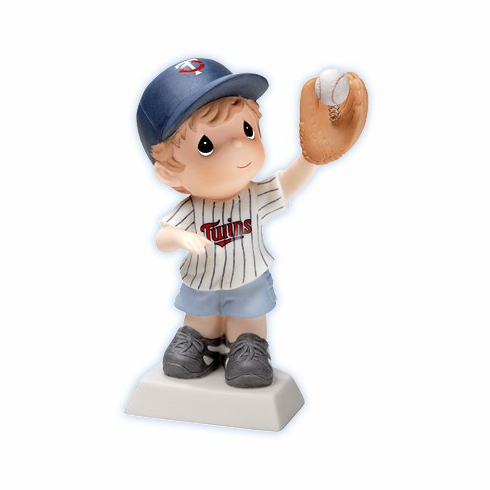 This Minnesota Twins Boy Catching Figurine by Precious Moments measures 5.25" tall. "You Get Me Caught Up In All The Fun"
Whether you are in the stands at a Twins game, in the backyard with dad or making the big play for your team, catching a fly ball can be so exhilarating! Dressed in his favorite team's uniform, this nimble boy is prepared to catch any ball that comes his way. His love of the game is sure to have everyone caught up in all the fun! Very limited quantities...RETIRED 2009 DESIGN.